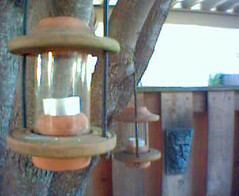 Hurricane lanterns in my wife's aunt's back yard. My first Flickr photo. Not a high quality one, but as good a test as any. It actually looks like arse when blown up. Taken on my old Ericsson T68i, it has been the background image on my last couple of phones. Anyhoo, please feel free to ignore, I'm just tinkering. I still think it's a cool photo. The white space to the upper right isn't so pronounced on your phone, though.